This weekend combines the practice of Ögyen Rig-nga - the practice of the Buddhas of the Five Elements - with Sky Weaving - a ritual Mahayoga practice of transforming personal neurotic demons. It will be lead by Ngakma Shé-zér Khandro, an ordained Vajrayana Buddhist teacher from the yogic Aro gTér tradition, who teaches regularly in Hungary and Britain. Ögyen Rig-nga is Padmasambhava and Yeshé Tsogyel manifesting as the Buddhas of the Five Elements. This practice provides penetrating insights into the nature of emotions, revealing the inner meaning of the five Buddha families and the mandala of the five dakinis. The weekend commences with an empowerment and instructions for the practice of Ögyen Rig-nga, the Buddhas central to the Mahayoga teaching on Sky Weaving. Saturday Daytime - Sky Weaving - the Namkha of the Aro gTér Tradition. 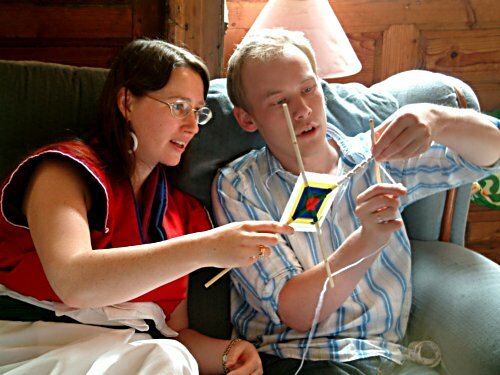 The practice of Sky Weaving is called 'Namkha' in Tibetan, which means 'sky' or 'dimension'. This meditation practice combines the practice of Ögyen Rig-nga with weaving 'skies' of five-coloured wool into a thread-cross. Each of these 'skies' link our personal energy with the energy of the elements, through the Tantric craft of sound and vision. The beauty of the Sky Weaving is empowered through the mantra of Ögyen Rig-nga, to magnetise personal 'demons' (neuroses, fears and obsessions). These demons are then released within the skies of each element. In Tantra we talk of the 'skies' of the five elements; earth, water, fire, air and space. Each element is a sky (dimension) of meaning, and each element is associated with an emotional confusion and a liberated energy. During the weekend you will make your own Sky Weaving, to transform your own personal circumstances, under the guidance of Ngakma Shé-zér. The morning will be used to conclude the creation of your own Sky Weaving, and allow time for information discussion with Ngakma Shé-zér. After lunch the weekend will conclude with the Jin-Sreg Fire Ceremony. During the Fire Ceremony the Sky Weavings will be effectuated by being consigned to the flames.